Attracting the best producers and helping them sell product is vital to your agency's success. But if you're not using the right technology to help you recruit and retain top talent, you're probably working at a competitive disadvantage. SmartOffice gives you the tools you need to build a stellar roster of advisors and keep them informed about products that will benefit their clients and prospects. Our suite of dynamic management, communication and reporting tools are built with insurance sales professionals in mind. Your producers are your revenue generators. SmartOffice helps you find the best talent and better manage those relationships. Identify new sales opportunities for your existing advisors and deliver relevant product information and marketing materials. Build automated, multi-step recruiting workflows that help you vet candidates quickly and thoroughly. You can't know how well your producers are doing without hard data. SmartOffice gives you real-time insights into just how well your recruiting and marketing efforts are paying off for your business. 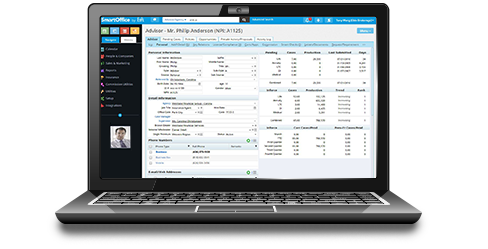 Generate comprehensive, consolidated reports showing producer sales and trends. Set up custom dashboards that provide up-to-the-minute metrics on your operations. Link proposals to actual production statistics.